The Nilfisk models with self-cleaning filter makes it possible for you to use the machine bagless. The cyclone effect is made by the bend, located in the container, which fills the container even better. Simply clean the filter by opening the container and shake the filter – depending on use; do this only 2-4 times per year. High performance in houses up tp 150 sqm. This machine gives you the performance you need in houses up to 150 sqm, or a pipe line on maximum 30 meters. All Nilfisk central vacuum cleaners have wireless technology, so that they can be fittet with the hose of your choice. This produkt is only a machine. If you need a complete installation kit look for All-in-1 Supreme 100, or buy pipes, fitting and hosekit seperately. Imagine a vacuum cleaner that is easy to use, highly efficient and almost silent; one that you don't have to carry upstairs; won't bump into the furniture or walls, get stuck in corners and that expels it's exhaust air outdoors. It does exist - the Nilfisk central vacuum cleaner. The concept is simple: Plug the flexible hose into the wall inlet, start vacuuming and focus on the cleaning task, not balancing and weight lifting. The dust is brought through the pipes to a bag or container in the central vacuum cleaner, located in the garage, basement or attic. The exhaust air is lead outside the house. The vacuum cleaner starts and stops automatically when the hose is connected to an inlet. No control features available. explained in the user manual. dust bag or clean the filter, when the airflow is blocked or service is needed, in case of overheating or out-of-range; plus it has a 5-speed suction power level. The Deluxe hose also has a battery level indicator. High performance in houses up tp 250 sqm. This machine gives you the performance you need in houses up to 250 sqm, or a pipe line on maximum 50 meters. This produkt is only a machine. If you need a complete installation kit look for All-in-1 Performer 250, or buy pipes, fitting and hosekit seperately. High performance in houses up tp 500 sqm. This machine gives you the performance you need in houses up to 500 sqm, or a pipe line on maximum 50 meters. This produkt is only a machine. If you need a complete installation kit look for All-in-1 Performer 150/250, or buy pipes, fitting and hosekit seperately. All Nilfisk central vacuum cleaners have wireless technology, so that they can be equipped with your choice of hose. With a convenient number of wall inlet valves installed throughout your home you can move the hose from inlet to inlet so as to cover the entire area of your home. The inlet valves as connected to the power unit through tubing. The tubes transport the dirt to the central dust container, and you never have to deal with it except once or twice a year when the container needs emptying. It is an extremely convenient, hygienic and flexible system that is adaptable o homes of all sizes, houses and apartments alike. For houses up to 150 sqm. For houses up to 250 sqm. For houses up to 500 sqm. To make the installation more convenient, kits are designed to fulfill what is needed for a normal house. Do-It-Yourself (DIY) ‘All-in-1’ boxes from Nilfisk contain everything you need for installation in most houses. But naturally, you can also purchase pipes, elbows and inlets separately. Installation can be done in only one weekend. 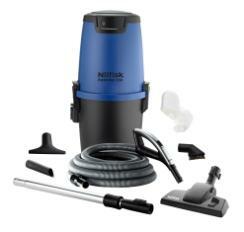 Nilfisk Performer DIY All-in-1 is a practical solution and is suitable for most homes. The hose is 9 meters and covers approx. 90 spm. You can choose between a Manual, Wireless + or Deluxe hose. The new and powerfull Nilfisk Performer gives you constant suction, and with the inovative Deluxe model the control of vacuumcleaning are rigt at the fingertips. For further detail and overview of features see table below.